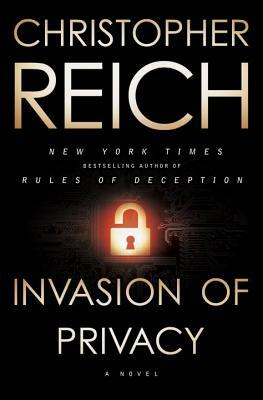 One woman's quest to discover the truth behind her husband's death will pit her against a new generation of cutting-edge surveillance technology and the most dangerous conspiracy in America--Invasion of Privacy is the riveting, new standalone suspense novel from New York Times bestselling author Christopher Reich. On a remote, dusty road forty miles outside of Austin, Texas, FBI agent Joe Grant and a confidential informant are killed in a deadly shootout. Left to pick up the pieces is Mary Grant, Joe's young wife and mother of their two daughters. The official report places blame for the deaths on Joe's shoulders . . . but the story just doesn't add up and Mary has too many troubling questions that need answers. How did Joe's final voice mail--containing a cryptic warning for Mary, recorded moments before the fatal shooting--disappear without a trace from her phone? Stonewalled by the FBI, Mary will be drawn into a deadly conspiracy that puts her in the crosshairs of the richest and most powerful men in America . . . and the newest and most terrifying surveillance system known to man. CHRISTOPHER REICH is the New York Times bestselling author of The Prince of Risk, Rules of Deception, Rules of Vengeance, Rules of Betrayal, Numbered Account, and The Runner. His novel The Patriots Club won the International Thriller Writers award for Best Novel in 2006. He lives in Encinitas, California.